The ethical obligation to serve the public is integral to the practice of medicine, the legal profession, and the military. Those who enter these ‘‘helping professions’’ are expected to subordinate their own interests and beliefs in order to serve others, even those they dislike or disagree with (Dickens, 2009). For example, doctors risk infection to treat others, lawyers defend heinous criminals, and soldiers risk death and must kill others when they go to war. The refusal to kill in a war may well be morally defensible, but as an act that compromises a country’s objectives in war (such as self-defense), it is also considered socially irresponsible and unacceptable. Historically, military objectors have been harshly penalized, often with imprisonment or even execution. Most western countries today protect CO for military service, but objectors must still justify their stance, are often required to undergo a rigorous review process, and are frequently punished (National Peace Museum,2006). At the least, they are required to assume other burdens to compensate for their refusal. In contrast, the ‘‘right’’ to CO in reproductive healthcare is widely accepted, even though refusing to provide an abortion for a woman in the difficult situation of an unwanted pregnancy has adverse consequences for her, not the objector. Not only does it negate a woman’s self-determination, it could harm her health and can result in unwanted children. Yet healthcare professionals usually face no obligation to justify their refusals, rarely face any disciplinary measures, retain their positions, and even have their objection protected by law. Health systems that refuse to provide abortion services similarly face no national or international sanctions, even though that refusal contributes to significant maternal mortality and morbidity in many parts of the world (World Health Organization, 2011; Council of Europe Parliamentary Assembly, 2008a). 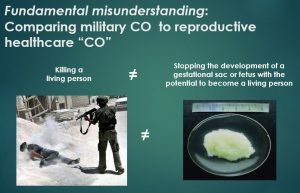 Some argue that abortion is a type of killing (of the foetus or embryo) and therefore CO is just as relevant in medicine as in the military. 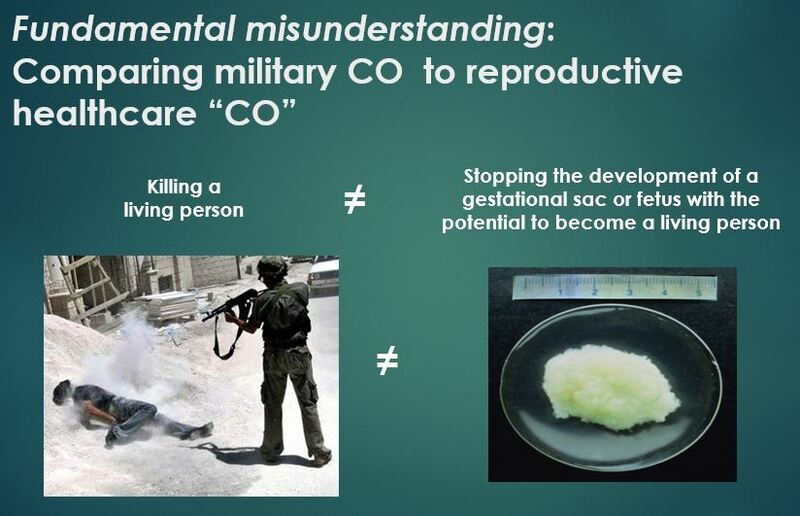 However, killing a living person in war cannot be equated with stopping the development of a gestational sac or foetus. The latter has only the potential to become a person — it is still an inseparable and fully dependent part of a woman’s body and not an individual human being. Embryos and foetuses are rarely given the same legal status as a born person, except in a handful of countries like Poland and Nicaragua where the Catholic Church hierarchy imposes its doctrines on the legal system. Further, the alleged parallel in terms of refraining from killing is turned upside down for CO in reproductive healthcare. Abortion and contraception preserve the health and lives of women, while those practicing CO put women’s lives at risk and sometimes even sacrifice them (Attie & Goldwater Productions, 2005). CO in a military context is generally only invoked when military service is compelled via a draft, by ordinary citizens who have no power over others. In contrast, healthcare professionals are not forced into being a doctor, nurse, or pharmacist, and doctors are not compelled to be gynaecologists. 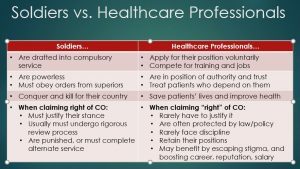 They enter such careers of their own free will after successfully competing for training and positions, knowing in advance the full range of duties they will be expected to perform and their responsibility to patients who depend on them. 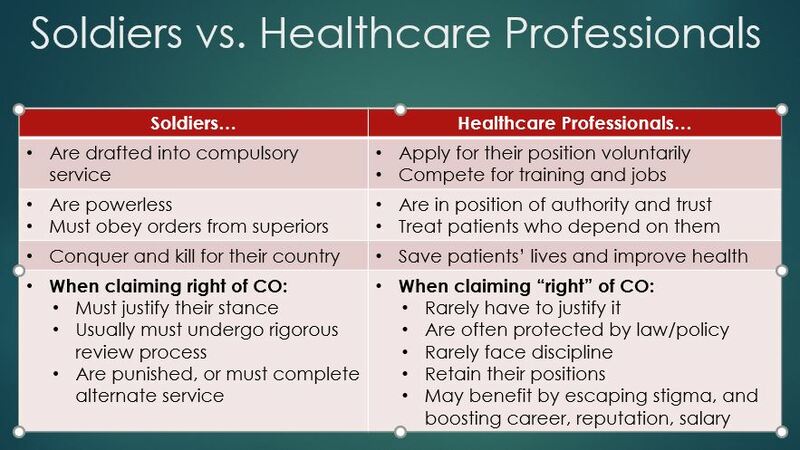 This power imbalance between healthcare professionals and patients is a reversal of that between foot soldiers and their commanders. The legitimate exercise of CO can only be by the powerless against the powers-that-be — not by the privileged against regular people who rely on them for essential services.